Welcome to the USA Football Team Mom of the Year application. In order to be considered for the award, you are required to complete and submit this form. MinuteClinic, the walk-in medical clinic inside CVS/pharmacy® and official sports physical provider of USA Football, is recognizing and rewarding hard-working football team moms across the country. Being a football team mom is tireless work that often goes unnoticed, but USA Football and MinuteClinic want to celebrate the accomplishments of the true most valuable players – football team moms. USA Football and MinuteClinic will select 100 outstanding Team Moms and award them with Nominee Care Package full of game day accessories. 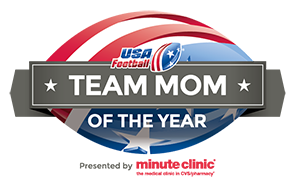 Ten (10) finalists will be selected by an online vote to compete for the Team Mom of the Year Award, which includes a $5,000 equipment grant for your organization, a $500 spa gift certificate and a Team Mom of the Year jersey. Each of the 10 finalists will receive a $1,000 equipment grant for your organization as well as a $100 gift card to Sports Authority. What type of football do you play? What level of football do you play? Is your organization enrolled in Heads Up Football? Who is the leader (Commissioner or Athletic Director) of the organization? What are your responsibilities as a football Team Mom? What makes you an exceptional football Team Mom? If selected, your head shot will be shown on the Team Mom of the Year webpage.